Double Mold Injection Push Retractable. All with White barrels. 250 1 color(s) imprint at $231 ONLY $0.92 each. 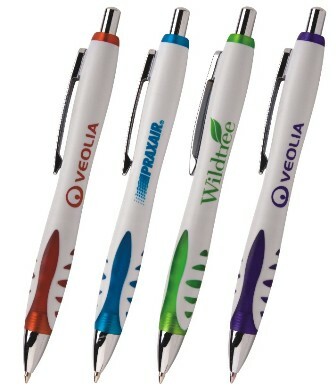 300 1 color(s) imprint at $249 ONLY $0.83 each. 500 1 color(s) imprint at $321 ONLY $0.64 each. 1000 1 color(s) imprint at $501 ONLY $0.50 each. 2500 1 color(s) imprint at $1,137 ONLY $0.45 each. 3100 1 color(s) imprint at $1,391 ONLY $0.45 each.